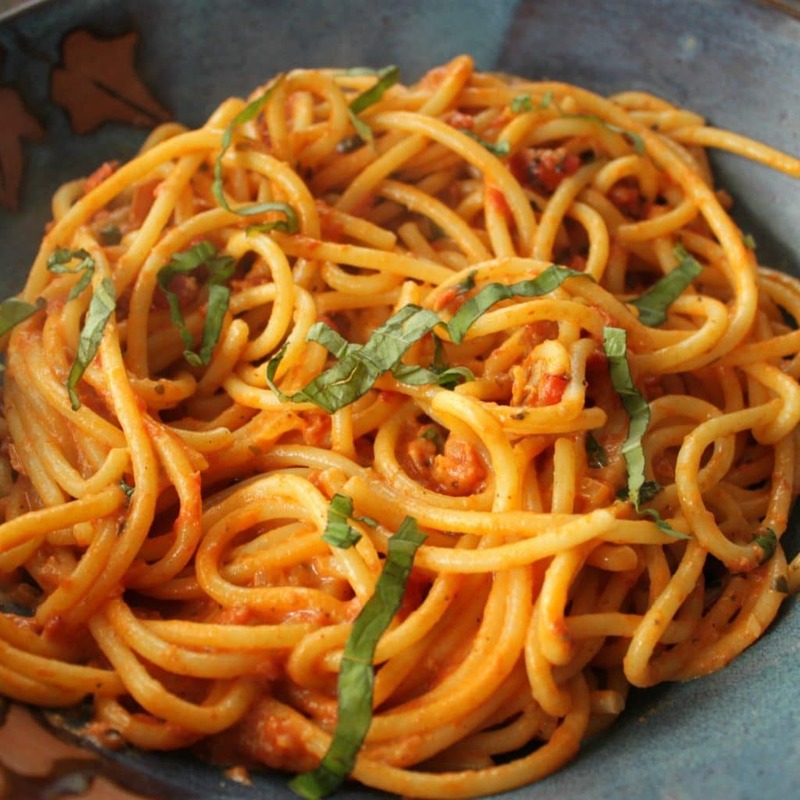 This Vodka Sauce recipe is easy, quick and SO delicious! Guaranteed to bring your loved ones to the table. 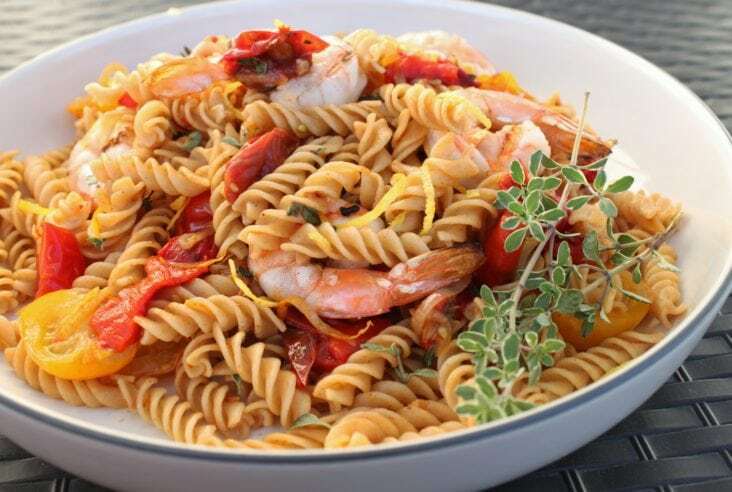 Serve with your favourite pasta and add chicken or shrimp for extra protein. I went for a drive in the country today. I started on the highway and got up to a great cruising speed with some good driving tunes to egg me on. Driving eastward, in the direction of home (Saskatchewan, the place of my birth and childhood). All the while knowing that I couldn’t go all the way there. Instead I settled for some rain soaked gravel roads. They were just gravelly enough to be fun and rutted enough to jostle my body to wake me up. Then I went home for breakfast and back to real life. I’m a prairie girl at heart and the prairie roads will always bring me home. 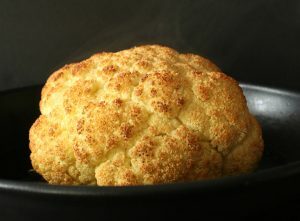 Is there a dish that brings you home? For me that dish will always be my grandpa’s Goulash made with wild meat. He’s in a home now and at 92 years old I’m sure cooking Goulash is the last thing on his mind. 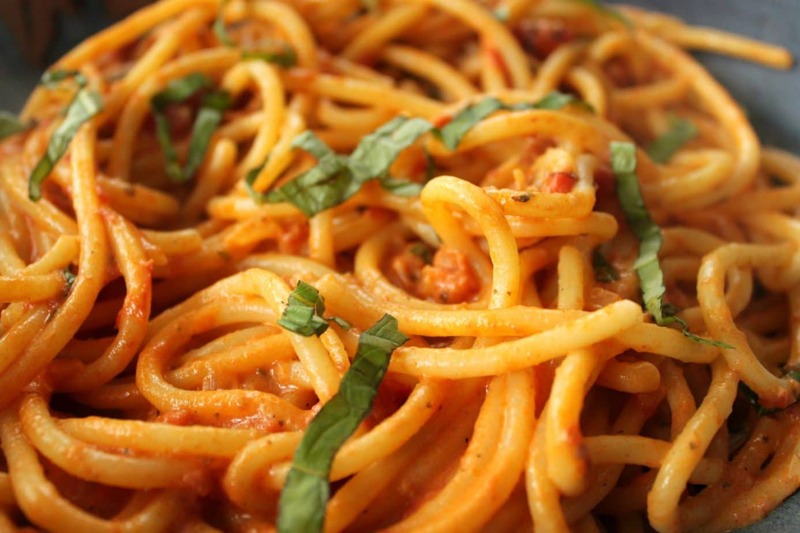 For many people, pasta is the dish that brings them home. 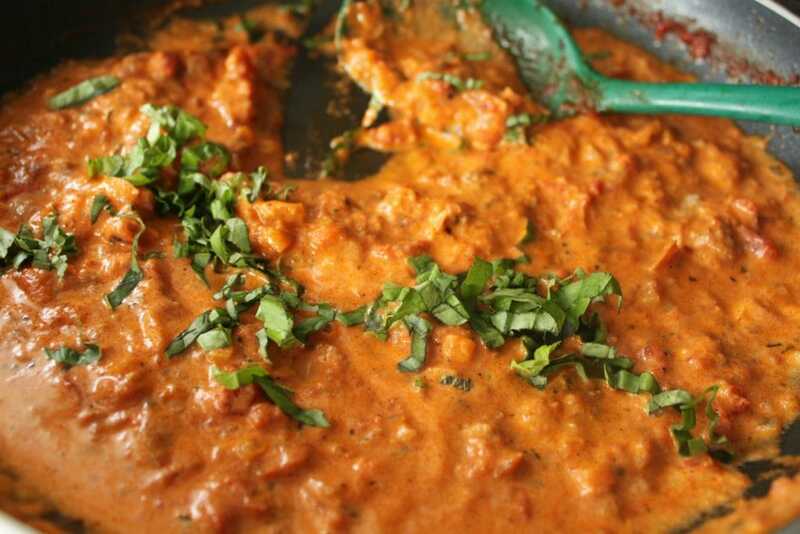 It’s pure comfort, especially when laden with a rich, creamy sauce. There were many smiles and compliments around the table the day I made this sauce. Perhaps this sauce will be the dish that brings my kids home someday. This Vodka Sauce really checks all the boxes. Creamy and rich, with just that hint of a bite from the vodka. Then there’s the hint of umami and acidity from the tomatoes. Perfection. I used to buy this sauce all the time because the kids love it so much. Now I’m saving money and I can pronounce all the ingredients! The whole family was really happy with my little experiment and I think I lucked out in creating such a great recipe on the first go. I hope you enjoy it as much as we did! 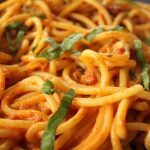 This Bucatini alla Vodka recipe is easy, quick and SO delicious! Guaranteed to bring your loved ones to the table. Add chicken or shrimp for extra protein. Sauté the onion in oil and butter until it’s translucent, then add the garlic and sauté for another minute. Add the vodka and allow it to reduce by half. Add the chicken stock and tomatoes (and/or passata) and bring to a simmer. Season. While the sauce is simmering cook the pasta according to directions. I used Bucatini which is a long pasta like spaghetti but with a hole running through the center. You can use any pasta you like. Add the cream to the sauce and bring up to temperature. Drain your pasta and toss it in the sauce, along with the torn fresh basil leaves. Add cooked shrimp or chicken if you like. Enjoy! Ha! That really is a silly title, but geez! this looks fantastic. I love vodka sauce and have never made it. I’m always so curious as to what purpose the vodka has in the sauce. Don’t get me wrong I love a good martini with three olives! You’ve made me crave spaghetti now. to be honest…I really don’t know, maybe a certain warmth. I cheaped out a bit as a whole cup seemed wasteful to me. It was still good though. I do know it’s not the same without it for sure! i had a moderately priced Polish vodka. it wasn’t bad. 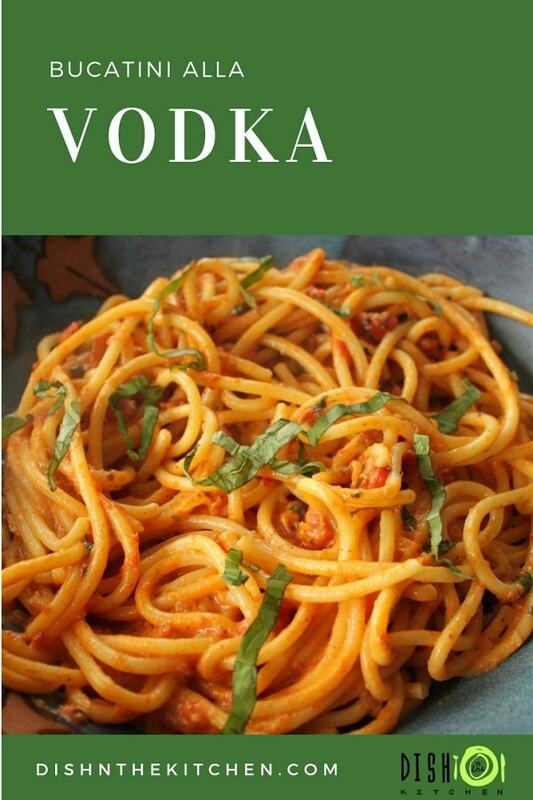 You know, I’ve never used vodka in pasta dishes. It just always seemed too strong for me. But Ineed to finally try it, and your recipe sounds wonderful! 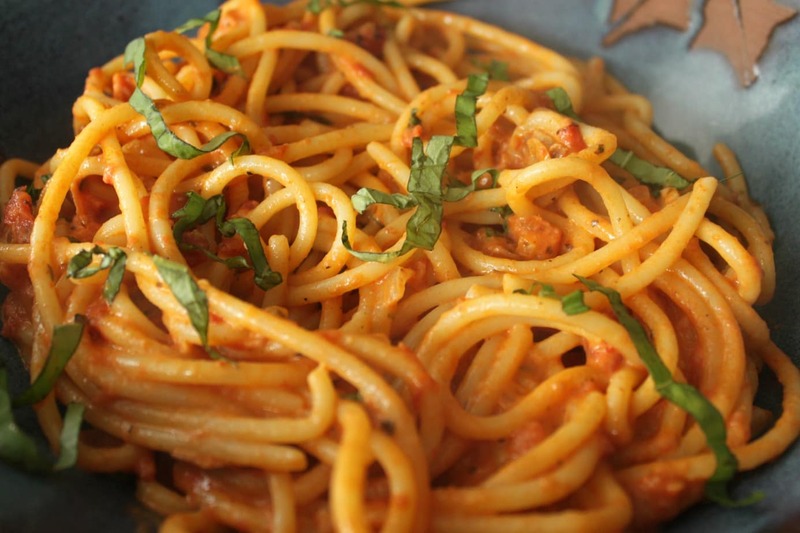 Vodka sauce is a favorite comfort food dish over here too. Rachel Ray tries to be quirky- ridiculous 🙂 This version looks delicious though! !